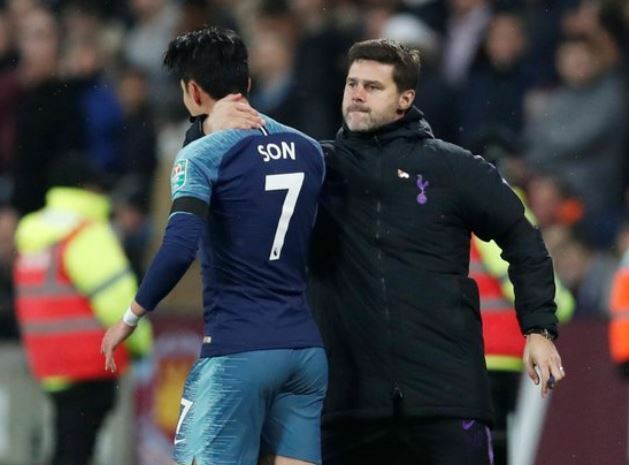 Tottenham Hotspur's South Korean attacker Son Heung-min has ended his scoring drought this season after netting two goals against West Ham United. Son grabbed a brace in Tottenham's 3-1 win over West Ham in the fourth round of the Carabao Cup at London Stadium in London on Wednesday (local time). It was Son's first two goals in 10 matches in the 2018-19 season. Son had not scored in five English Premier League appearances, three UEFA Champions League contests and one Carabao Cup match prior to the duel against West Ham. The 26-year-old South Korean has had a busy international schedule as he took part in the 2018 FIFA World Cup and the 18th Asian Games in Indonesia, where he won a gold medal. He also played in South Korea's four friendly matches under new head coach Paulo Bento after the Asian Games. West Ham later cut the deficit to one with Lucas Perez's header in the 71st, but Llorente secured the Spurs' spot in the domestic league cup quarterfinals with his goal in the 75th. "I think the most important thing is that we won," Son said in a post-match interview with Spurs TV. "We're in the next round and finally, I scored." Son added: "I've been feeling very sorry. It feels really, really good to score again for this team."